While most people were on their way to work in the Capital today, I was on a quick detour (also on my way to the office I hasten to add). Yes, it involved the hospital. And, yes it involved this rather exciting gold box. Now don’t be deceived by its shiny exterior. Inside this box is one of the largest and strangest syringes I have ever seen – and would ever want to see. That’s because, like a lot of syringes, it’s not designed to administer liquid. Instead, it houses an implant (a small pellet) that needs to be injected under the skin to release a drug called Goserelin. In the hands of a nurse with no local anaesthetic cream (and only a side and not a stomach in which to inject said implant), there is only one outcome – and it’s pretty painful. Why would I want to inflict this optional pain on myself I hear you ask? 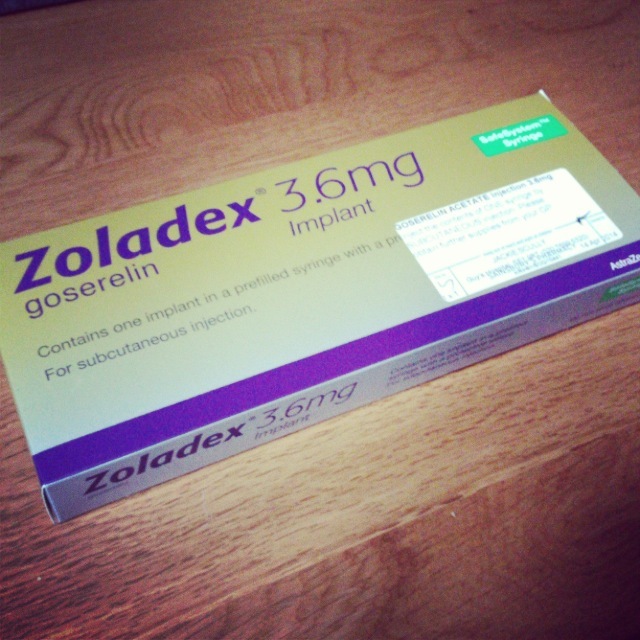 Well, if you’ve followed my fertility journey, you’ll know that Goserelin (otherwise known as Zoladex) is all part of the try-to-stop-cancer-taking-away-my-fertility plan. Even though we have embryos in the freezer, we would still rather not use them. Zoladex is a synthetic version of a natural hormone that controls how the ovaries work. By switching off the production of oestrogen, it suppresses the ovaries and sends women into an artificial early menopause (hot flushes here we come). Just when you thought you’d had enough of side effects, it throws in a few more! Now, it’s not the first time I have received this injection (the first one was alluded to in lesson number 42). I have already had a hot flush and I still have three more to go. But, it is the first time I’ve not just slotted it alongside other news of the day. And that’s because, it’s a big syringe, with an even bigger role to play. Nobody wants to sit in the chemo chair thinking they haven’t done everything they can to protect their ovaries and their chance of bringing children into the world. Everyone undergoing chemo should be given the choice, where appropriate, to go up against this oversized needle and endure a period of self-inflicted hot flushes. If the prospect of being able to have children fades before your eyes, you’ll know just why this gold box deserves a little post all to itself. Goserelin is not just a side note in the fight against cancer. It’s a star. This box also reminds me of just how amazing medicine really is. We often take it for granted as we’re popping our paracetamol and rubbing in our ibuprofen gel. But, medicine has given us hope where are bodies have tried to take it away. Medicine knows how to trick cancer cells – and kill them. Medicine is the reason I can still picture myself changing nappies. And, most importantly, medicine is the reason I am alive today. I am in awe. Read the Goserelin (Zoladex) factsheets and they sometimes say that the use of the drug during chemotherapy is still something currently being tested as part of clinical trials. Apparently oncologists don’t all agree about its use in this context. I’m not an expert, but I am writing this because I want to help others in my situation find out about the options. You may not be able to receive the drug (or have it recommended to you), but now you know to ask – and that’s all that matters. You also know not to look inside the box or at the needle. You just need to do what needs to be done. In every other way, it was a normal day at the office. But, as I sat there answering emails and discussing visuals, I couldn’t help but smile at the throbbing in my side. Inside that little pellet is where the magic of medicine really comes into play. It may not work for me, but I will always know I gave it my best shot. I had zoladex injections for a year back in 2000 ,the nurse would do mine no anaesthetic cream she always asked me to come first thing in the morning ,she was trained to give me them .She would always say God I hate doing these first time I seen the size was when she put her head on my tummy and it was ready to go in her hand ,mine went alternate sides I would just say to her pinch me hard and shove it in it look like a hollowed out dart .Its been nearly 16 yrs now and I’m still here to tell the tale .